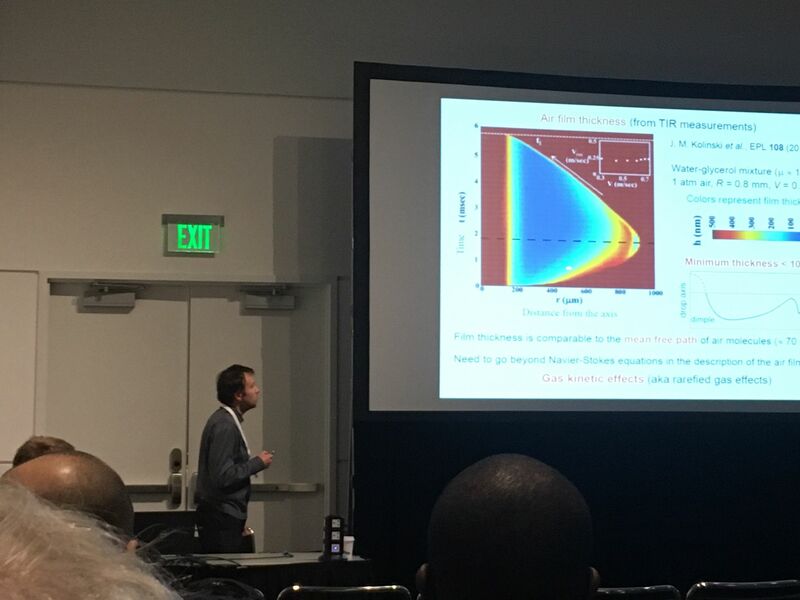 Recently, from the 19th to the 21st November of 2017, I was part of a group of researchers from the University of Warwick that attended the 70th annual meeting of the Division of Fluid Dynamics (DFD) of the American Physical Society (APS) in Denver, Colorado, USA. This is a well-established international meeting with a large turnout. Besides having invited talks, posters, and the well-regarded Gallery of Fluid Motion with videos, the main body of the conference consists of usually more than thirty-five parallel sessions in all topics related to fluid mechanics, from theoretical aspects and mathematical foundations to experimental techniques, passing through high-performance computational fluid dynamics, and from nano- and micro-fluidics to flow in the Earth’s atmosphere, oceans, and even in the outer space. Because I attended many talks in those three days and it would be impractical to refer to each of them, I will briefly summarize here just a few of them that I consider as highlights. They are all related with phenomena typical of the flow at the nano- and micro-meter scales. 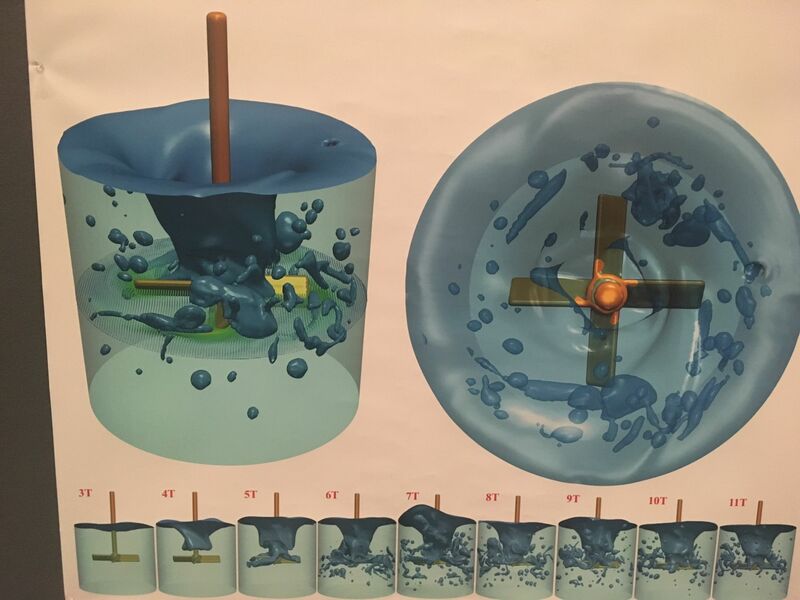 A rotating impeller in an open container: Highly resolved numerical simulations with code BLUE by Kahouadji, Chergui, Juric, Shin, Craster, and Matar @MatarLab. First, in the third session on evaporation and heat transfer on drops, Takeru Yano discussed the solution of the Boltzmann equation in the half-space for the non-equilibrium gas flow having a planar interface undergoing evaporation or condensation. He studied the flow on the basis of the numerical solution of the Boltzmann–Krook–Welander (BKW) equation. In the journal “Fluid Dynamics Research”, this author presented an article that explains in detail part of his talk at the 2017 APS DFD meeting. Secondly, within the focus session on “Modeling, Computations and Applications of Wetting/Dewetting Problems III”, Vladimir Ajaev talked about modeling the motion of contact lines over substrates with spatially-periodic non-uniform patterns. The mathematical analysis was carried out using the lubrication approximation, and including evaporation, capillary effects due to interfacial-tension variation with temperature, and disjoining pressure (DP). It is worth noting that the last factor was modeled as the superposition of the van der Waals DP and the electrostatic DP. These two-component DP model is recommended when dealing with fluids, such as aqueous solutions, where electrical charges, in the form of ions, are present in the body of the liquid. In the first part of this focus session, a member of our Micro- and Nano-Flows Group at Warwick, James Sprittles, presented his talk on kinetic effects in dynamic wetting. In the session on instability, break-up and splashing of drops, a presentation that caught my attention was that co-authored by Riboux and Gordillo. In their talk, they extended previous work on modeling the fluid dynamics of the thin liquid sheet ejected after drop contact with a solid surface in the splashing process to include the effects of the boundary layer. They showed good agreement between theory and experiments. More details of their work can be found in this article. Dave Emerson, from STFC Daresbury Laboratory, during his presentation at the 2017 APS DFD. 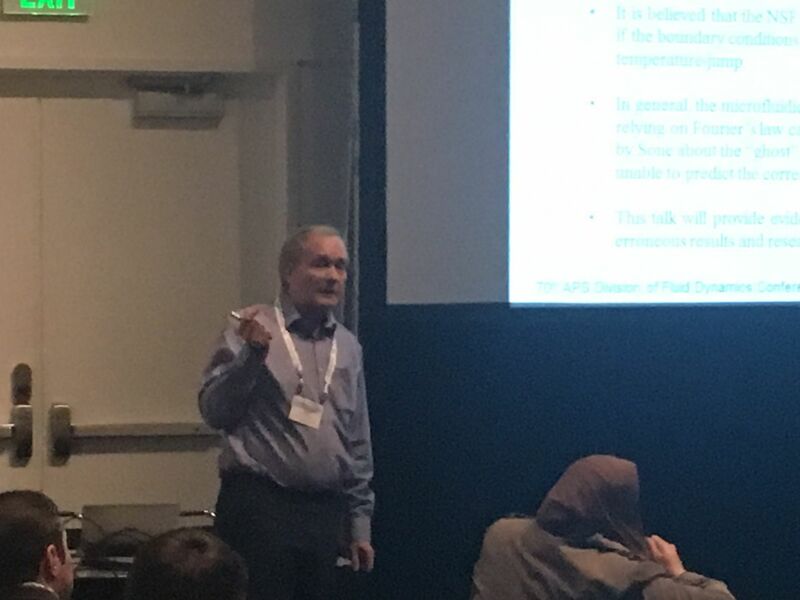 In the session on Modeling of Microscale Flows, Dave Emerson, another member of our group affiliated with STFC Daresbury Laboratory also in the UK, presented a talk discussing the challenges with modeling thermal flows in the slip-flow regime. He commented on recent results that suggest that using the Navier-Stokes-Fourier equations with modified boundary conditions to account for rarefaction effects for thermal problems in the slip flow regime can produce erroneous answers. Emerson presented alternative modeling approaches based on macroscale field variables capable of overcoming these limitations. There were also several invited talks. For instance, Jen Eggers talked about the role of singularities in hydrodynamics and Detlef Lohse discussed the characteristics of turbulent flow arising from Rayleigh-Benard or Taylor-Couette instabilities. In particular, I would like to refer to the invited talk given by Sungyon Lee on two-phase flow in a Hele-Shaw cell. Flow in a Hele-Shaw refers to fluid motion in the narrow space between two wide parallel plates, with a gap in the order of a few millimeters or smaller. It is a useful and practical set-up that serves as a surrogate to study the inaccessible flow of one or more phases in porous media. 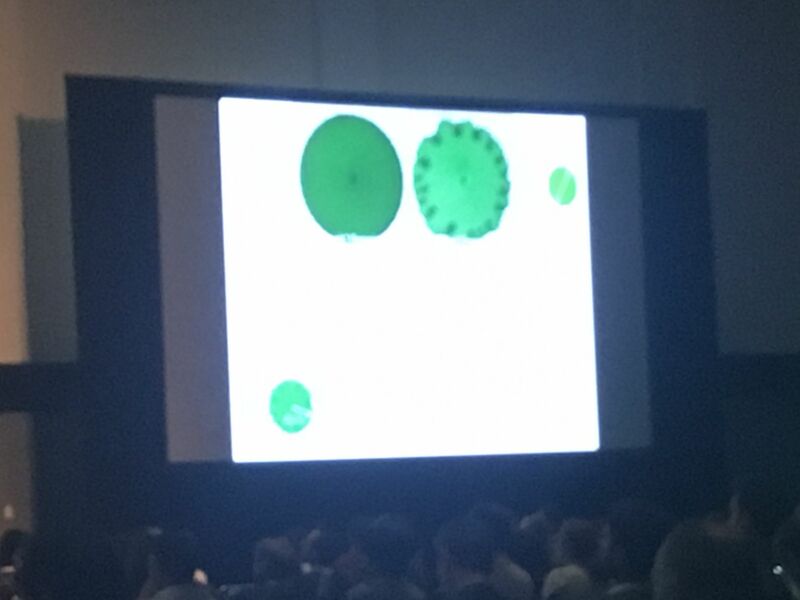 In her talk, by means of videos of experiments conducted by her research team, she showed that a more viscous fluid displacing a less viscous one in a Hele-Shaw cell — a stable configuration in the sense that an initially smooth interface remains smooth throughout its motion — can lead to an unstable moving front when solid particles are injected and transported near the interface. More details can be found here. Sungyon Lee talking about particle-induced instability when a more viscous fluid displaces a less viscous one at the 2017 APS DFD. The participation of J.C. Padrino in the APS-DFD annual meeting of 2017 in Denver was possible thanks to a research fellowship funded in the United Kingdom by the Engineering and Physical Sciences Research Council (EP/N016602/1).